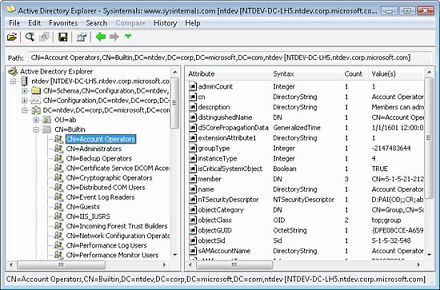 All SharePoint administrators or consultants have a bag of tricks and tools that they use to do their job, from scripts, software or various other things. There’s one in particular that I’ve found quite useful (and most I ask haven’t heard of) is AD Explorer. I’ve found this has saved me a lot of time. As you likely know, SharePoint primarily relies on Active Directory for the user account system. Nine times out of ten, SharePoint’s User Profile Service is configured to sync with Active Directory on a daily basis so that a user’s email, phone number, title and other information is visible in SharePoint. But without access to Active Directory, you have no way to know what their profile information actually is, if they are a member of a group, etc. You get a call that Jenny got married and AD was updated a week ago, but SharePoint’s profile is still showing incorrectly. You verify that this is the case, and that the sync is working properly. You’re not in IT and you need to verify that Jenny’s AD account is actually updated. So we have go through IT and they just say yes, but how do you know FOR SURE? With AD Explorer, two problems are solved – you don’t have to contact IT and you can check it yourself! Just login with any domain user account (it doesn’t have to be an admin account), and you have a full read-only view of all of AD. Go find (or search) for any user and go verify Jenny’s properties yourself! Now very quickly you can efficiently troubleshoot your issue with the User Profile Service! If you have an issue with the User Profile Service in SharePoint (or anything else for that matter including quantum mechanics or the meaning of life) contact us!